While this giveaway is a little “out of season”, don’t discount its value. The Go With Me chair from Kelsyus isn’t JUST for camping or sitting around a fire. Kids are constantly on the move. They run, they play, they throw, they yell and they wiggle….even while sitting. We have more than our fair share of spills thanks to not-so-stable sitting arrangements for our kids (and kids we know!) And by “arrangements” I mean logs, buckets, camping tables and foldable camping chairs. I couldn’t be more excited to share all about this “camping chair ” (which we are using all year round here – indoors AND outdoors). New fromKelsyus, the Go With Me Chair really is adaptable for kids aged ~3 months to 6 years. PLUS, it is sturdy (we have yet to get it to tip over). – Stage 2: Standing (still in that harness) through leg holes that are exposed by opening a flap that covers the seat and unfolds from the bottom. 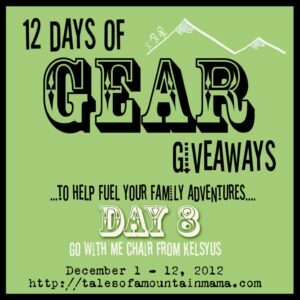 Kelsyus has generously offered our readers a coupon code for 10% off a Go With Me Chair at Kelsyus.com. Use code: BLG112K. Even better, they are currently offering FREE ground shipping until December 14th! 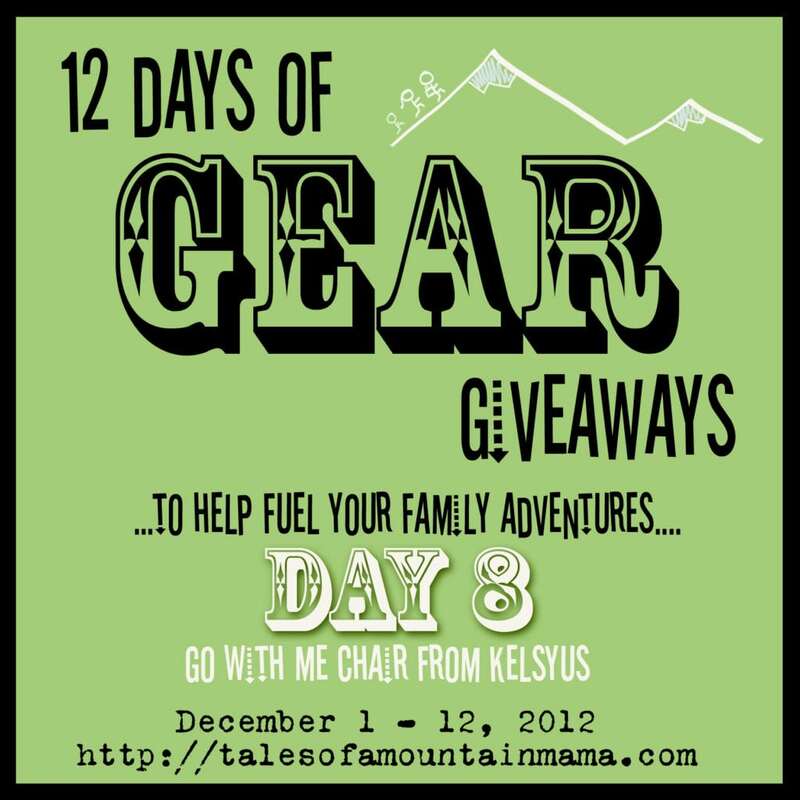 To enter to win a Kelsyus Go With Me Chair, please use the Rafflecopter Widget below. 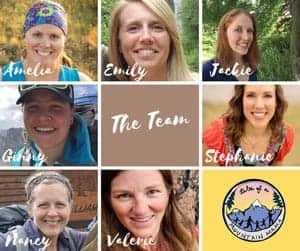 If you have any questions at all, please email me at mountainmamatales(at)gmail(dot)com and I will be happy to help you out! Good luck! Kelsyus generously provided us these chairs for the purposes of facilitating the review. As always, the opinions expressed here are completely and honestly our own. I always have a cooler that can double as an extra seat or small table for preparing food. Usually bring our folding camp chairs. Also love to have a hammock to chill in too. Folding camp chairs…we don’t just use them for camping, we don’t go anywhere without them! I always like to bring some kind of chair for relaxing around the campfire. Totally depends on what kind of camping we are doing… I certainly like some sort of chair or stool for myself! I always bring a chair of some kind. sometimes i just bring my crazy creek, it’s always in my car ready to go. does a hammock count as furniture? And yes, i love s’mores around a campfire, epecially during the fall. We always bring our folding camp chairs – my husband is dying to get a couple zero gravity chairs for next year, if he’s good Santa might just deliver! I also wanted to add that I think these chairs are brilliant! Even if you don’t camp, what a fantastic chair to have with you in the car for when you are visiting others! We also always brings chairs, and a coffee pot! I would think those collapsible/folding chairs are a must. Smores are pretty important too! 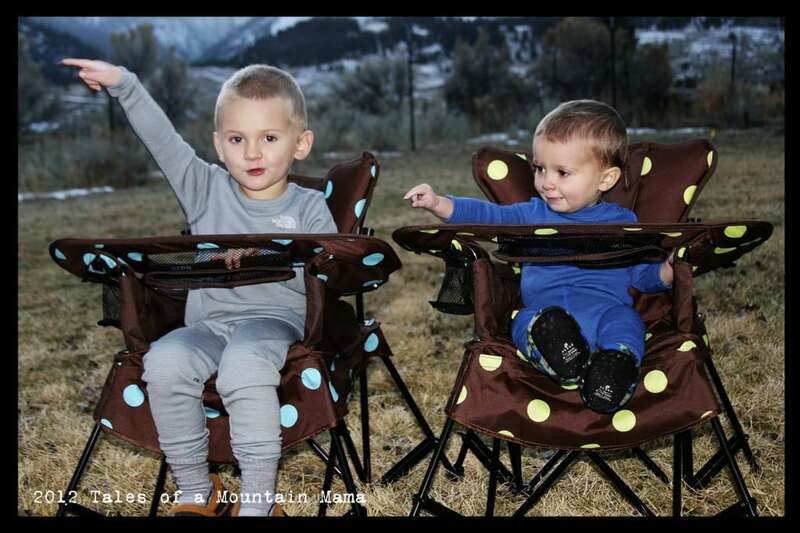 We definitely prefer roasting smores….. but folding chairs are perfect for sitting by the river! We bring folding chairs everywhere. And we have S’Mores every time we go camping! Yummy! No furniture just sitting around campfire. Before kids, it was standing around, but now with kids we use camp chairs if possible or stumps or logs. They love roasting s’more’s, though they really just like the marshmallows. The favorite for my oldest is to roast, and then hold out the blackened marshmallow for the youngest to eat off the stick. My new favorite adult s’more is graham crackers, marshmallows with chili pepper dark chocolate. Yum Yum! Folding chairs , Crazy Creek chairs, and our raft cooler that triples as a cooler, bench and then put it back into the VW van to be the foot of the bed! This Go With Me chair would be perfect for our son to sit around the fire and make “weeooo weeooo” (fire truck) noises! Always have to have our chairs in a circle around the campfire. We like the cheap folding ones that go into a bag and can be carried over a shoulder. We always have our camping chairs and now that we have a kiddo the pea pod is a must as well. Folding chairs are essential and s’mores are a must! Smores are a camping must! We also tote are camp chairs and just recently picked up an old travel trailer. We always bring some folding camping chairs but half the time we end up sitting on the tailgate of the truck. Camp chairs are usually the only furniture we pack. Of course we bring the bag chairs. I always bring a beach chair too, being by the lake. And then theres also extra tables because one picni table is never enough room. We bring the standard single camp chairs. Sometimes, we throw in our camp loveseat, whch served as our ‘couch’ in our home for the first several years of our marriage! 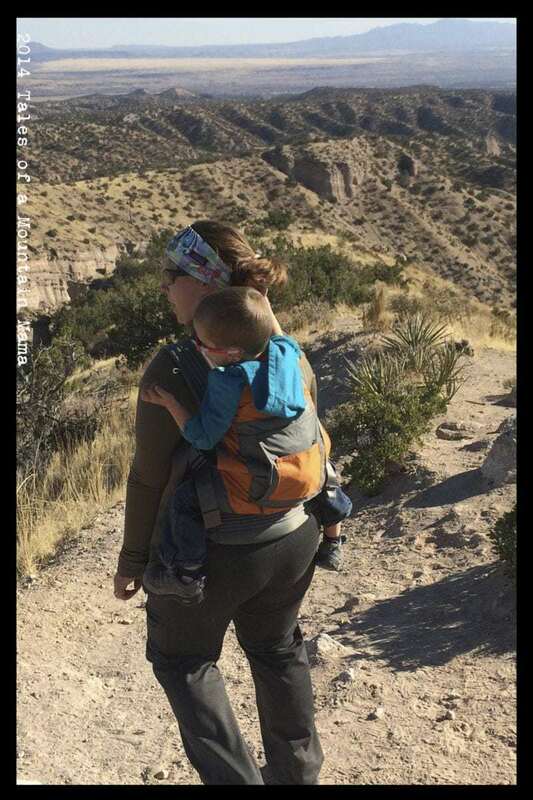 We camped with our three-month old last month and just held him, but I imagine we will need a little chair for him soon. These look great! We always bring camping chairs for the kids. Smores are required at our campsite! Depends on our location, but bringing a collapsable dish basin is a must for us when we camp in Moab. We always seem to have a sand laden child by the end of the day and that usually leads to an itchy rash unless we give her a quick bath before jammy time. That fine sand is just too hard to brush off! We like to sit around the campfire at all hours of the day, and so far, our toddler likes her marshmallows untoasted and her chocolate drinkable. But, I imagine one day soon she will be ready for the traditional s’mores! We bring camp chairs but the smallest one (for our toddler) tends to fall over easily. Can’t go camping without smores! We always bring chairs, sometimes a hammock. I can see why this would be a great chair for kids as I can remember being concerned when my son was a bit younger that he would tip over the camp chair in his attempts to get in and out. Looks like a great product! I love having comfy camp chairs for camping. These look really cool! The bumbo was a must have this summer … But now we need a big girl chair. I always bring fold out chairs because sitting on a log isn’t always that comfortable. We do two kinds of camping: car and lite. When we go lite we don’t bring anything to sit on but when we car camp we usually bring collapsible chairs, nice but bulky. We always bring chairs! And yes I love smores!!! These chairs look awesome! We bring folding chairs. We tend to keep it simple for camping. The chair for the little ones look great. 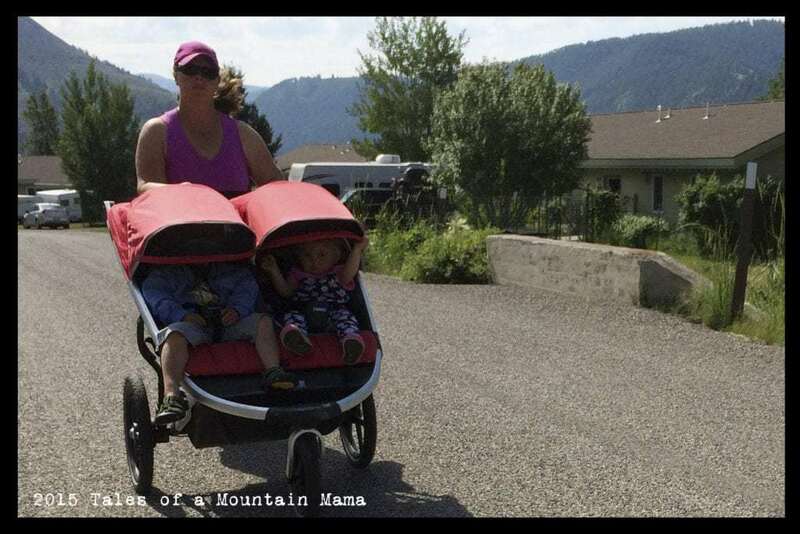 *laughing* Finding someone’s lap to sit and feed the small ones when camping (without bringing a big ‘ol high chair with you) has always been the challenge of taking the little ones. I believe that people would take their small children with them camping with this product more often. It looks practically tip-proof too. We always bring chairs, but somehow I am always standing as little ones take my seat 🙂 And yes, roasting forks or sticks are a must too!